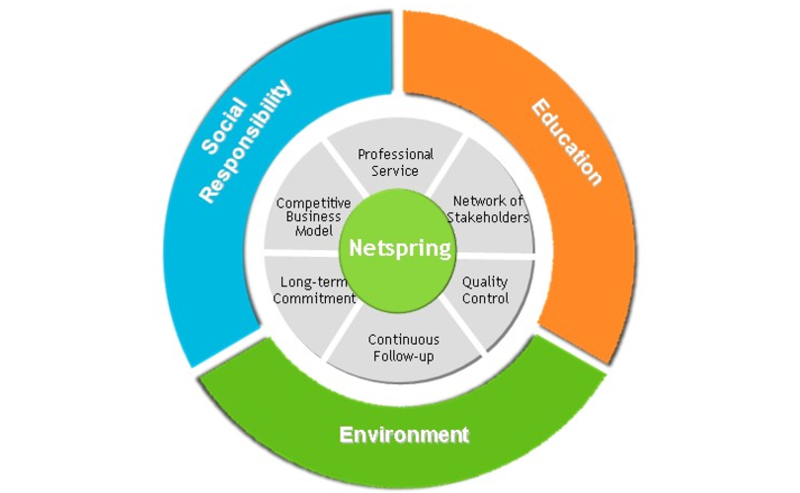 NETSPRING, with its “Green IT Classrooms” program, is committed to protect the environment and help underprivileged children in China by developing the recycling economy, creating shared value between developed and under-developed Chinese areas and helping vulnerable groups such as poverty-stricken students or people with disabilities. 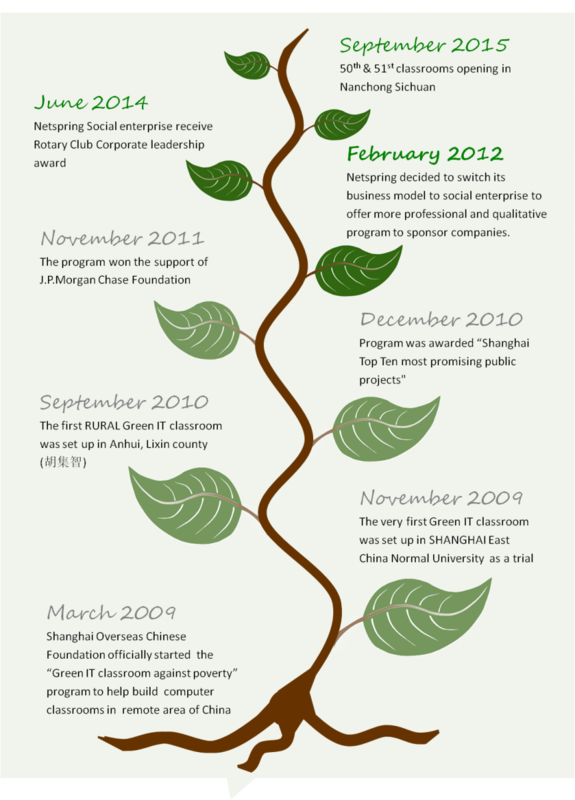 NETSPRING was born from the encounter between leaders of the Shanghai Overseas Chinese Foundation and an international strategic advisory firm, with strong expertise in innovative CSR, during a conference organized by Fudan University Xu-Ricci Dialogue Institute (see our history tree below). Computers and other electronic equipment become obsolete more and more quickly, as market trends are endlessly changing. In China, at least 5 million computers are discarded and turned into e-waste every year. Over 70% of them are collected by illegal recycling vendors, dismantled and even burned in a very rough way. Such practice causes massive toxic chemical release, heavily polluting the air, the water and the soil, and is harmful to human health. However, parts of such obsolete computers are still in good working conditions and could be reused after appropriate repair. At the same time, more than 50 million Chinese students in under-developed rural area have no access to computers and the internet, preventing their chances to acquire digital literacy and to study in the future. They are striving to learn more and widen their horizon. NETSPRING focuses on mobilizing key stakeholders such as companies, institutions or universities to provide their old computers, for 3 years, to schools that lack IT resources. At the end of the program NETSPRING collects back the computers and have them dismantled in certified factories in an environmental-friendly way. To promote this program among partner companies’ employees and local communities NETSPRING organizes opening ceremonies, volunteer and team building activities in the schools. Additionally our team operates a close follow-up during the whole duration of the program to ensure that IT resources benefit to the children in a proper way. Netspring Ltd (Social Enterprise) is a pioneer social enterprise, founded in Hong-Kong in 2012. The company launched the “Netspring Green IT Classroom” Program to “Transform e-waste into e-education” for underprivileged children’s digital inclusion and the promotion of a circular economy model. After successful launch of the pilot program by Netspring Ltd and founding members in 2012, Shanghai Yiquan Social Enterprise, was established in PRC in 2013, as an operational company to support the development of additional Netspring Green IT classrooms in China. In 2017, the program social impact was enriched with new Special Needs Green IT Classroom in support of the Visually Impaired in China. In 2018, Netspring launched its 3R Box Collection to strengthen its environmental impact. Since 2012, NETSPRING is committed to protect the environment and to help underprivileged kids by developing the recycling economy, creating shared value between developed and under-developed Chinese areas and helping vulnerable groups such as poverty-stricken students or people with disabilities. To date, the Netspring Green IT program has provided digital learning to more than 30 000 children in 20 Chinese provinces, organized over 100 volunteer activities and protected our environment by helping organizations to dismantle or re-use more than 80T of e-waste.